Some of Russia's neighbors are looking to boost their military capabilities in the face of the nuclear-armed power's continued occupation of Crimea. Polish Prime Minister Donald Tusk, for one, said "the conflict [in Ukraine] should accelerate the modernization of the Polish army." 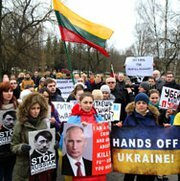 "After the events in Ukraine, the Russian aggression, the need to increase [defense] spending will be better understood by Lithuanian people, and there will be more support for it," Juozas Olekas -- the defense minister of another neighboring state, Lithuania -- told Reuters in a Friday article. Lithuania and its fellow Baltic nations, Latvia and Estonia, joined NATO in 2004. They and other former Soviet-bloc states like Poland -- which joined the Western alliance in 1999 -- traditionally have remained more wary than Western Europe of a Russian military threat. Russia's incursion of Ukraine's Crimean Peninsula has validated the Baltic countries' sense that they were right to fear Moscow, according to the news service. "There has been a concern that U.S. and NATO are focusing on other parts in the world, such as Afghanistan or China, and not giving enough attention to Eastern Europe," said regional expert Allan Sikk of the University College London. The United States has responded to the Ukraine crisis by increasing the number of fighter jets on patrol duty over the Baltics and planning extra military maneuvers with Poland. Next week, the U.S. military will deploy 300 troops and 12 F-16s to Poland for a bilateral exercise that has grown in scope following the occupation of Crimea last weekend. "Russia is a threat to the whole of Europe," Lithuanian President Dalia Grybauskaite said on Thursday in Brussels. "And Europe must finally understand what it is dealing with." For its part, Warsaw already is planning on spending billions of dollars to establish a domestic antimissile system that would focus more on defending against lower-altitude missiles that Russia could launch. The Russian Foreign Ministry on Friday blasted NATO for its decision to suspend all lower-level contacts with Russia and to reassess its higher-level engagement, as well, Reuters separately reported. "We see as extremely dangerous attempts to bring in the 'NATO factor' to Ukraine, where the situation is complex and delicate as it is, as it creates additional tension and undermines the prospects for settling the situation," the ministry said in a statement.